achieve these goals while considering their specific needs as a healthcare facility. * Due to confidentiality agreements, we are not able to provide the client name. We will refer to the firm as Hospital throughout this case study. research labs, vivariums, and offices. Cimetrics collaborated with the hospital and their building automation system provider to connect to and collect sensor and actuator data from over 59,000 physical points. Data was collected every 15 minutes, 24 hours a day, 365 days a year, for a total of approximately 5.7 million data samples per day. The following systems were monitored: 135 Air Handling Units, 2 Chillers, 187 Heating & Cooling Pumps, 82 Fume Hoods, 4,820 Terminal Units, and other miscellaneous equipment. regular basis to help answer questions, coordinate implementation, and provide regular feedback on progress. of 55°F. The simultaneous heating and cooling resulted in excess heating and cooling costs. 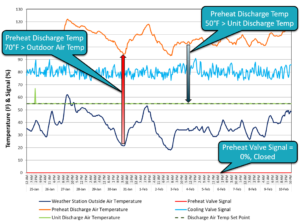 This issue was not detected in the occupied spaces due to proper space temperature control and lack of comfort complaints; however, it was identified with Analytika. 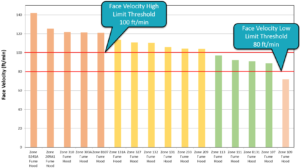 Cimetrics identified fume hoods that have face velocities greater than the high limit threshold of 100 fpm, which result in excess energy use, as well as face velocities below the low limit threshold of 80 fpm, which have safety implications. Cimetrics also identified airflow setback opportunities to reduce energy use during unoccupied periods. 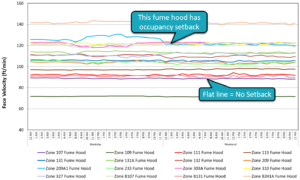 Cimetrics worked with facilities staff to optimize fume hood face velocity and airflow to ensure compliance with safety requirements while minimizing the economic impact. Contact us to find out how the powerful Analytika technology can translate your system data into meaningful, actionable insight today!